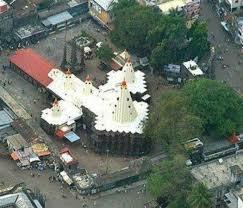 Here is Some Information about Mahalakshmi Temple( Eyes of Godess Sati Devi Shakti pith) in Kolhapur Maharashtra India. Live Darshan Time: 12:30 P.M. To 07.30 A.M. 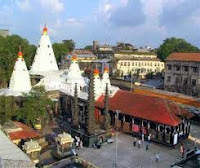 The Mahalakshmi Temple is located in Kapiltirth Market, Kolhapur Maharashtra.The temple was built in 700 AD.The temple is dedicated to Mahalakshmi Goddesh Durga.The statue of the Goddess Mahalakshmi is made of gemstone and is considered to be at least 5000 to 6000 years old. It weighs about 40 kilos.Kirnotsav in Mahalakshmi Temple Kolhapur (festival of Sun rays) is celebrated when the sun rays fall directly on the deity's Mahalakshmi idol at the time of sunset. The main entrance Mahadwara of the temple is the western entrance. 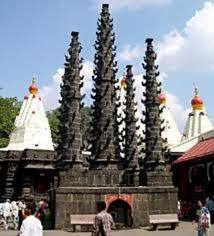 Upon entering the Mahadwara one is confronted with several deepamaalas on either side, and enters the Garuda mandap with square pillars and foliated arches of wood, characteristic of Maratha temples. This mandap dates back to the 18th century. An image of garuda faces the sanctum. Another stone mandap, on a raised platform enshrining Ganesh, also faces the sanctum. Following this is the mandap with three shrines facing west. The central one is that of Mahalakshmi and the two on either side are those of Mahakali and Mahasaraswathi. The temple complex exhibits mortarless construction echoing the style of the early Deccan temples. Also to be noted here are the horizontal mouldings and the vertical offsets which create a rich light and shade pattern. Also seen in this temple is a rich display of sculpture of figurines in dancing poses, musicians, gods and goddesses. The three sancta have rather simple shikharas of brick and mortar dating back to the 19th century. The image of Mahalakshmi carved in black stone is 3 feet in height. The Shri yantra is carved on one of the walls in the temple. The sanctum is designed such that once a year, the setting rays of the sun fall on the face of the image of Mahalakshmi for a period of 3 days in the months of Pisces and Leo. Although several parts of the temple are of the second half of the second millennium CE, epigraphic references place the deity in the 7th century CE, and the temple in the 10th century CE. For a period in the interim, this temple had fallen out of worship and the image of the Goddess was housed elsewhere. Worship was restored in the year 1715 after the Marathas rose to power.The city is referred to in many Puranas, 500 years back. Research guesses that it was in existence in the times of Parashuram. The time is.considered parallel to that of Mata peeth (Mahurgad), Sapta Shringi (Nasik) and Bhavani Peetha, in the Ramayana times. Karveer washes off great sins. There are many ancient, rich temples, holy places and gardens. There is evidence to show that the Konkan king Kamadeo, Chalukya, Shilahar, Yadav dynasties visited this city. Adya Shankaracharya also visited. Chhatrapati Shivaji Maharaj & Sambhaji reigned. 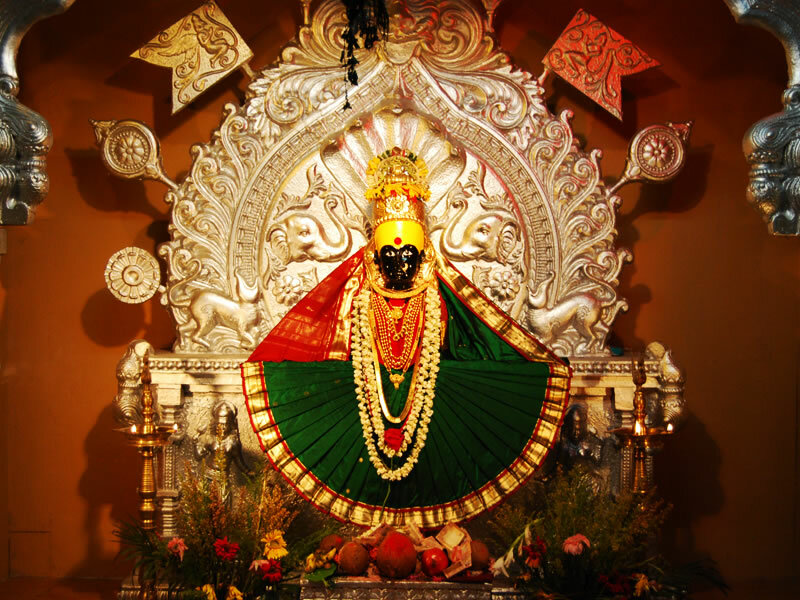 The idol of Mahalaxmi is made of jewel - stone, approximately weighing 40 kgs. The size is like Salunki. Sand & diamond are found in it. It stands on a stony stage with a lion behind it. In the middle there is natural lotus. It is four-handed, having Vetak, shield, Mhalung & Water-Pot. There is crown on the head and a snake holds shade. In 109 A. D. Karnadeo cut off the jungle and brought the temple to light. The existence goes back to 8 th century, according to Dr. Bhandarkar & Mr. Khare. In the 8 th century, the temple sank down due to earth­quake. In the 9 th century Gandavadix (King) extended the temple by building Mahakali Mandir. 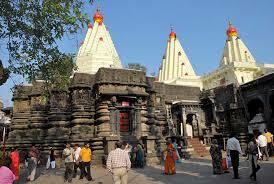 During 1178 -1209, in the reigo ofRaja Jaysing & Sindhava, South gate & Atibaleshwar Temple were built. In 1218 Yadav king Tolum built Mahadwar, and offered jewels to Devi. Further, Shilahar built Maha Sarasvati Mandir. He being a gain, got 64 idols carved. It is possible that new idol called Padmavati was installed at that time. Further, in Chalukya times, Ganapati before the temple was installed. It seems that the original temple was of the Hindus. In the 13 th century, Shankaracharya built Nagar Khana & Office, Deepmalas. 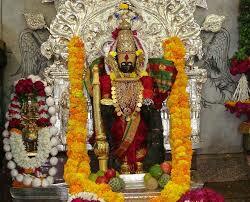 The number of devotees grew, and in due course of time, the Devi became the Deity of Maharashtra. The idol began to denude due to Abhishekas. So Sankeshwar Shankaracharya got it repaired. After Vajralep & sacrifices, it was again installed at the hands of Kolhapur Shahajee Raje in 1954. Navarathri-The word Navaratri literally means nine nights in Sanskrit, nava meaning nine and ratri meaning nights. During these nine nights and ten days, nine forms of Shakti/Devi are worshiped. Lalitha Panchami-The fifth day of Navaratri is celebrated as Lalitha Panchami. Ashtami-The eighth day of Navarathri is celebrated as Durga Ashtami. Navami-The ninth day of Navarathri is called Maha Navami. By Road: From Mumbai, Kolhapur lies around 400 kilometer and Pune over 240 kilometers. This region is located on National Highway no. 4, which lies between Pune and Bangalore. 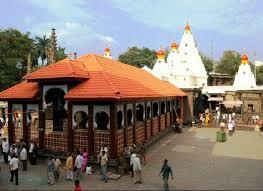 By Train:The closest railway station is Kolhapur which is located at a distance of five kilometers away. There are a large number of trains and expresses that passes through various major cities of India.